Except for the staggering intelligence of the most famous ancient Egyptian leaders, Egypt wouldn’t have such a recherché history with imposing historical events that can be presented in stories, courage tales, and can travel the world because of its venerable chronicle. The ancient Egyptian leaders were divided into 30 dynasties according to their reigns and to have a deep look inside their chronological classifications. 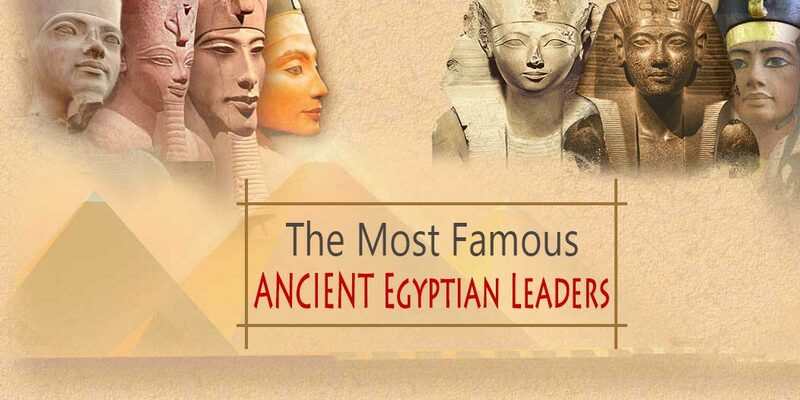 There were more than 150 ancient Egyptian leaders and here are the most famous ones with a short accomplishment of each one of them. King Narmer: was the one who unified Upper and Lower Egypt through the first dynasty. King Djoser: had his main accomplishment after establishing the first pyramid to be built “The Step Pyramid of Giza”. King Khufu “Cheops”: was the one who built one of the Seven Wonders of the World “the Great Pyramid of Khufu”. King Khafre “Chepheron”: ruled most of the areas in modern Egypt through the fourth dynasty and built “the Pyramid of Khafre”. Queen Hatshepsut: she reigned longer than any other woman in ancient Egypt through the 18th dynasty and built “Hatshepsut Temple“. King Akhenaten: ruled for 17 years during the18th dynasty and He started a Monotheistic Religion in addition to promoting realistic art. King Tutankhamun: ruled for 10 years during the 18th dynasty of ancient Egypt and he is famous for the treasures they found in Tutankhamun tomb including the death mask and of course the curse after opening his tomb. King Ramesses II: was the third pharaoh of the 19th dynasty and built a lot of statues, temples, palaces, and many other terrific historical landmarks including Ramesseum in western Thebes. Queen Cleopatra VII: was the last ruler of ancient Egypt and her intellect was her biggest reason to be a great queen. Alexander the Great: was able to unite Greece, conquer the Persian Empire and re-establish the Corinthian League. Harun El-Rashid “the 5th Abbasid Caliph”: divided the empire between his two sons Al-Amin & Al-Maamun and by doing this, he made each one stands in an individual way provided with all necessary supplies. Al-Nasser Salah Al-Din Ibn Ayyub “Saladin”: was the founder of Ayyubid dynasty and the one who built ” the great Citadel of Salah El-Din“. Muhamed Ali Pasha: built the astonishing Mohamed Ali mosque between 1830 and 1848 for the memory of his dead son Tuson. Ready for A Lifetime Trip to Egypt? Capture all of what’s captivating in Egypt through our splendid Egypt tour packages, Explore Cairo’s landmarks and witness the Pharaonic landmarks in Luxor & Aswan that witnessed the most ancient civilization throughout its history on luxury Nile cruises, enjoy all the natural beauty of the red sea and live the vacation you deserve.